There has been an increase in short-term bookings. When the economy tanked, people were hesitant to book further out. There are a multitude of reasons: Everything nowadays is so quick with email; people are busy and end up putting everything off till the last minute. But people are waiting to see what their meeting budgets are like, and I think this caused a shift toward people booking short term. However, I have noticed this year that the bigger associations and the bigger conferences are starting once again to have healthier budgets. They are starting to plan further out. The bulk of our business is, and probably always will be, statewide associations. However, we have seen an increase in corporate bookings this past year and into the next fiscal year. This indicates a healthier economy. Another good indicator is holiday parties — they often get nixed when things are tight. Last December we saw a lot more companies holding their holiday parties again. A lot of conferences now incorporate social media, like Twitter and that type of thing, during the conference. There is a greater need for high-speed Internet access because everybody has a mobile device. A lot of sessions for conferences include that, or they will do an internet café or set up an area for laptops so people can check email and do social media. There is also a healthy increase in attendance. That is a great sign. Before, companies would not necessarily provide lunch and things like that. There is an increase in adding back in networking time and having more food and beverage. We market ourselves as being centrally located. It is easier for people when they are coming from all over the state to get to our property, rather than going to the Coast or Central Oregon. There is increased interest in smaller events spaces. Our on-site restaurant has created a couple of semi-private rooms that are booked all the time with little groups. But in Salem, we don’t have a ton of competition. There was definitely a need for this convention center, because we can host the bigger events. The nonprofits in the area were hard-pressed to find a ballroom that can seat 800 people. We have some great conferences here: the League of Oregon Cities, the Governor’s Conference on Tourism. We host the Cinco de Micro Brewfest. As far as local events that draw a lot of people, that has grown crazy in size. They had 1,500 people last year from a Friday evening and all day Saturday. It has gotten to be a really well-known event in the area. We are starting to see more events that are open to the public. This year we are excited to host the Northwest Comic Fest in August, which is open to the public. Oregon Wedding Showcase is held here in October. They are very important. We are LEED certified. To be recertified, you have to follow strict guidelines on your purchasing and waste disposal. We were part of a pilot project three or four years ago, with what was then Allied Waste, to do composting. That pilot project was so successful that they implemented composting not only in businesses but also residentially. We have energy-saving lights. Heating and cooling are based on occupancy. A lot of meeting planners are very tuned into that. They ask for things like no individual packages and to buy more in bulk. I see business increasing. It is very healthy, and I see it continuing to grow. People thought Skyping and teleconferencing would do away with face-to-face meetings. But it has switched back to people seeing the value of bringing people together. That can’t be replaced by technology. 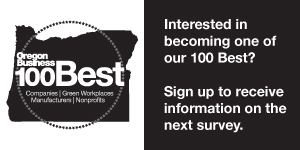 Click through to see an abridged power list ranking Oregon's meeting facilities by total square feet of meeting space.